Elements Applied: Stem shavings are commonly applied in herbal medicine. 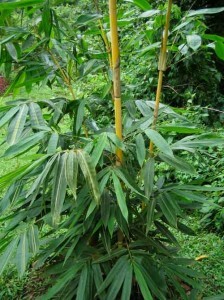 Used For: The extract is known to reduce fevers, relieve vomiting, boost expectoration and reduce bleeding. Bamboo shavings are specifically applied for yellow concentrated mucus, difficult to evacuate in case of respiratory system diseases, as well as for vomiting, induced by stomach fevers. In this case is can be mixed with coptis and pinellia. It serves as a good relief for morning nausea if mixed with pinellia and scutellaria. In Chinese medicine the extract is applied for reducing fevers and bleeding, associated with various conditions like menstrual bleeding, nasal bleeding, bloody vomiting, mucus and blood coughs. Preparation and Intake: The commonly used dose is 7 grams on average. Safety: Bamboo shavings are unsuitable for coughs associated with common cold and should be avoided by those with spleen dysfunction.